Have you ever traveled somewhere and discovered a strikingly bizarre local tradition that you later embraced? I suppose that's the best way I could describe the search for crested Saguaros. Saguaro Cacti forever bear the image of deserts around the world even though they only occur in a narrow range throughout Arizona and Sonora with a few specimens in extreme eastern California. 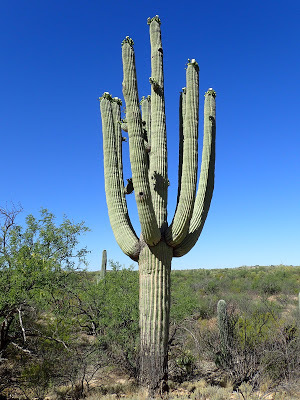 Why Saguaros became the stand in for desert scenery rather than far more common cacti is beyond me. I've traveled extensively across the Mojave, Chihuahuan and Great Basin deserts in the past though the Sonoran Desert of Arizona/Mexico I had missed. 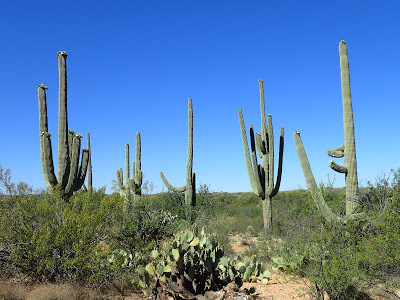 As part of my tour of Southeastern Arizona, I had spent most my time in the sky islands but my last days were spent in the Tuscon Area and Saguaro National Park. 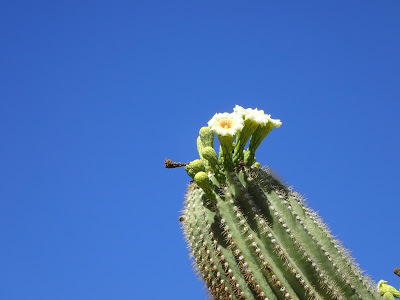 Life is abundant and flourishing in the Sonoran desert which has been called one of the lushest deserts on earth. Though plants are spread apart, it is not the sandy expanse that most think of when it comes to deserts. Spashes of green and ribbons of colorful rocks were far more common. 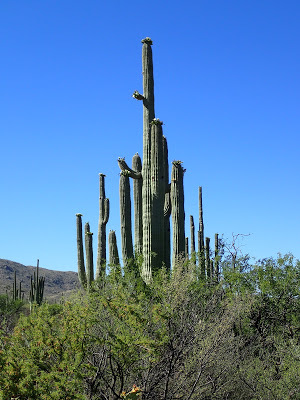 Now, in the right biome, Saguaros are a common sighting. Leave it only to Midwesterners like me to be captivated enough to be snapping hundreds of pictures. 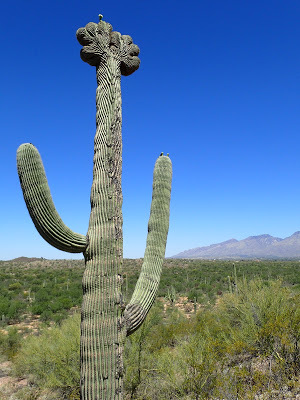 But even a thoroughly ingrained local will take notice of the Crested Saguaro. 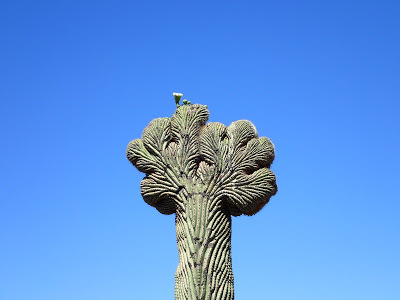 These mutant cacti are the four-leaf clovers of the desert, with less than 1,500 documented in Arizona and only about 25 in Saguaro National Park. 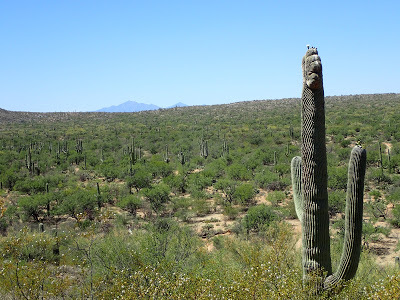 To be sure, one can easily find a crested Saguaro on the side of the road in the east unit of the National Park. Additionally, the Sonoran Desert Museum has a finely cultivated example. With enough googling, you could probably find exact directions to many crested saguaros. But where's the fun in that? I wanted to "discover" my own. Now, it is easy to get lost in the desert so I would not recommend you set out without abundant water, food, a map, compass and GPS for starters. There are no statistics on the number of people hurt per year searching for crested saguaros but I presume this could be a dangerous activity if necessary precautions are not taken. Wandering off trail in the national park is permitted though be careful to practice leave no trace ethics. I happened to visit in the late spring which was after the Ocotillos had bloomed but right in the middle of Saguaro Blooming season. Great bunches of white flowers burst from these stately green cacti creating an artistic visage. Other cacti were blooming with yellow and red flowers adding a rare level of vibrancy to the hike. Though I was sucessful, I wouldn't have minded if all I saw were some blooming cacti. Like most of these types of stories, I wandered for hours without finding what I was looking for. Of course, 15 minutes from the parking lot, I finally spotted the gnarly outline of a crested saguaro. Finally! I spent a half an hour taking photographs and enjoying the accomplishment. When I finally did make it back to the car, I could literally see it in the distance from my windshield. Oh well! In the weird but established world of Crested Saguaro hunting, this specimen is neither impressive nor noteworthy but it's pretty good for my first trip. Maybe I'll come across a more infamous crown in the future. Its a lovely oddity to come across, regardless of the height or size!